Direct oceanfront lanai. You can get a direct ocean view from both bedrooms too! Amazing and fun-B610 was a fabulous place and Ola Properties did a great job helping us through arriving and with a few problems/questions we had. The unit was clean and the furniture is in good condition. Beds were comfortable. A few beach things to use in the closet. The kitchen was well equipped. You can't beat the view and it would be hard to go to another unit after this one. There was a problem with the main air conditioning unit the last night that wouldn't correct, but it worked out fine, just a little warm. The floor plan offers great privacy. Beach Villas is beautiful and all the people who work there are wonderful. Paradise-The only problem with our stay was that it was not long enough. We LOVED the amenities at the Beach Club, the sunsets on the lanai, the sounds of the ocean, the beautifully tended grounds and pools, it was a wonderful vacation. 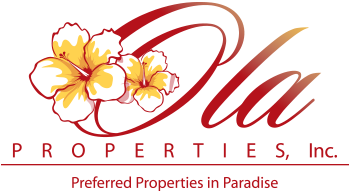 The folks at Ola Properties saw to it that all of our needs were taken care of. We will be back!